May the luck of the Irish be with you. 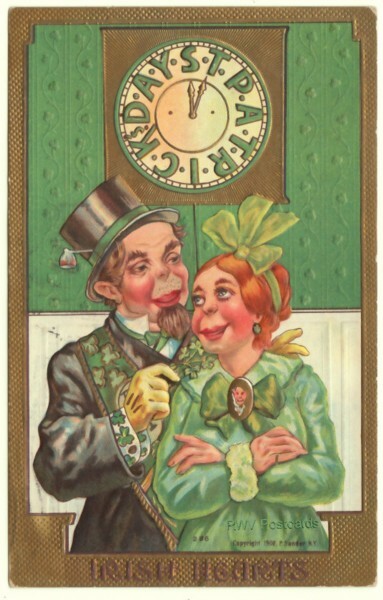 Happy St. Patrick’s Day from Remember When Vintage Postcards! Antique Postcard: Lucky 3-Leaf Shamrock? I was curious why the shamrocks on some of the St. Patrick’s Day postcards listed for sale in my store had 3 leaves, and others 4. I went looking for the answer. Did you know that the Shamrock, a summer plant with 3 not 4 leaves, was believed by those in ancient Ireland to have magical powers? These people also believed the number 3 was a powerful number. 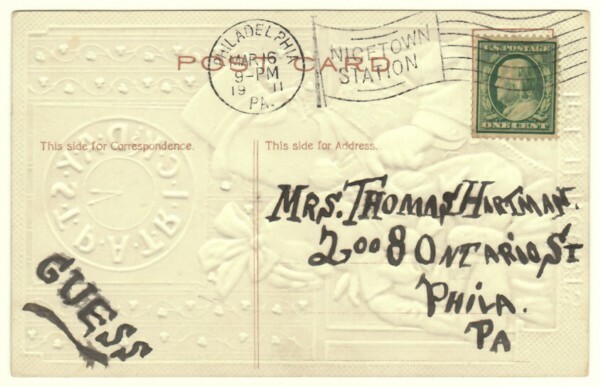 I never did find out why the shamrocks on some antique and vintage postcards were 4 leaf, but I learned something today. Cool. * Be sure to stop back in a couple of days to find out who got left behind, and who’s taken aback. Ahhh, a sender who’s a tease. OK, I’ll bite. My curiosity is picked. Guess what? This message would certainly draw attention to it for curiosity’s sake alone. Maybe that was the sender’s intention. He or she could have felt Mrs. Hartman wasn’t writing enough. Curiosity would get Mrs. Hartman to write just to find out the answer. At any rate, the brief message opens up a whole lot of possibilities as to what person or thing was being guessed about. Care to take a crack at this one? ** If you liked this post and want to share it, please click on the bookmark button to the right.